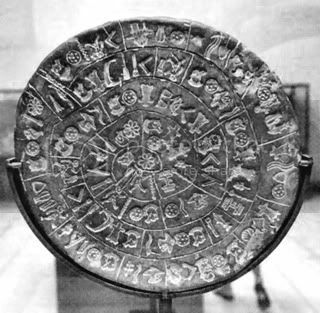 Furthermore the text on the Phaistos Disc is unique; no other examples of the script stamped on it have ever been located. This uniqueness and the fact that the text is fairly brief, makes it extremely difficult to hope to translate even a small part of it. That the inscription was made using a set of stamps would imply that there was large-scale production of objects impressed with this script, which, for one reason or another, have not yet surfaced in archaeological investigations. A difficulty with understanding the artifact is that no-one knows exactly how the symbols on it are meant to be interpreted. Does the disc contain a hieroglyphic inscription, or pictograms meant to be taken at face value? Although some images on the Phaistos Disc are pictures of familiar objects, trying to understand these literally does not help with obtaining any coherent meaning from the disc. Many linguists believe the text is a series of written signs representing syllables (known as a ‘syllabary’), while others assume it is a syllabary combined with pictorial symbols used to express a concept or idea (known as ‘ideograms’). The combination of a syllabery and ideograms would make it comparable to all known syllabaries of ancient Greece and the Ancient Near East, including Minoan Linear B, hieroglyphic writing and cuneiform. The latter consists of pictograms drawn on clay tablets with a pen made from a sharpened reed, and originated from ancient Sumeria (modern southeastern Iraq) in the late 4th millennium BC. The Palette of Narmer is an interesting example of such texts. It was discovered in Nekhen, (modern Hierakonpolis,) the ancient Pre-Dynastic capital of Egypt, by English archeologist James E. Quibell in 1894. It dates roughly to 3200 BC and includes some of the earliest hieroglyphic inscriptions ever discovered. The Palette of Narmer uses a combination of hieroglyphs and pictographic symbols which are to be taken literally to mean what they depict, indicating a possible parallel with the disc of Phaistos in the sense that it could be interpreted as containing a mixture of ancient Cretan hieroglyphs and pictographs. The tremendous difficulty of translation without further examples of the supposedly ancient script has not dissuaded both scholars and amateurs from attempting the task, in fact the unique nature of the text has added to its mystique and enthralled rather than repelled investigators. The distinctiveness of the Disc has, unfortunately, meant that there have been a number of highly imaginative and unsubstantiated ‘translations’ and interpretations of the pictographic text on the Disc. Perhaps the most extreme among them is that the object contains a message left thousands of years ago by extraterrestrial visitors to the Earth, or an ancient Atlantean civilisation, for future generations to discover. The question of what exactly the message contains or why it was written in such a primitive script by supposedly advanced aliens (or Atlanteans) has, of course, never been answered. Powered by WordPress v 4.9.10. Page in 0.228 seconds.